The Create screens are where you catalogue your object. There are lots of fields to choose from, and to make it easier to negotiate we created three tabs you can use while you are cataloguing; Detail, Core and Public. You can choose whether you want to see the full set of cataloguing fields (Detail Fields), the core set of fields (Core Fields), or only publicly displayed fields in eHive (Public Fields). You also have four tabs to record Acquisition, Administration, Conservation and Valuation details about your object. You can move freely between all of these tabs to see your object’s data, you do not have to save before moving to another tab. You will notice as you scroll down the page that the fields are grouped into different thematic sections. As you finish cataloguing one section, you can press the triangle to the right to fold up that section of the page. To expand a section, press the same icon again. The Save and Save Draft buttons are located at both the top and bottom of every Create screen. When you save a record, you have the option to publish it to eHive or keep the record private. For more information please see the section on saving and publishing records. You can use a saved object record as a template to create other similar records. For example, if you are cataloguing a series of screenprints by the same artist that contain a lot of similar information, you can use the Create a Similar Object option to save you some data entry time. Select the record that contains the information you would like to copy, essentially the template record for the other records you wish to create. Click on the object to view it in detail view, this will show you the saved view of the record and will not take you to the Create Screen. 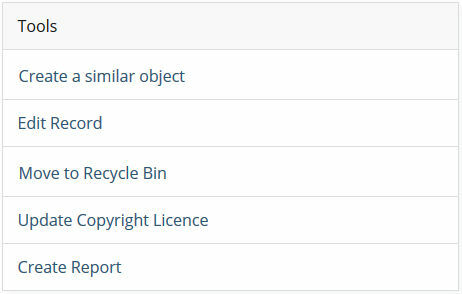 Click on ‘Create a similar object’ in the Tools section on the right hand side of the record. This will copy data in all fields into a new record for you, and will take you to the Create Screen for your new record. All data is copied across except for the Object Number. Proceed with cataloguing your new record, amending any of the existing data that has been copied across as necessary.